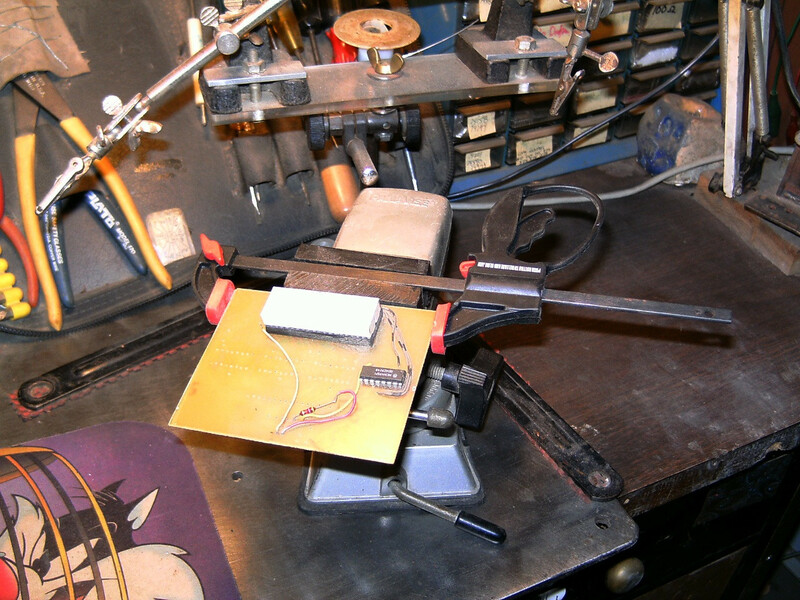 Panavise is a popular tool with hobbyists, particularly for electronics. However, it can take many knobs turns and a lot of time to open and close the jaws. This Instructable shows how to quickly open/close the jaws with a power drill or power screwdriver (which you probably already have) via a coupling nut attached to the vise screw. Watch the video to see it in action. Since the Panavise screw is a standard 10-24 thread, a coupling nut should be readily and cheaply available from your local hardware store. Attaching the coupling nut should only take about 10 minutes. One 10-24 thread coupling nut from your local hardware store. You don't need the more expensive stainless steel version your hardware store might try to sell you unless you plan to leave your Panavise out in the rain. Power drill or power screwdriver with 5/16 nut driver. If you don't already have a 5/16" nut driver it's best to just buy a set. For less than $5 I got a 10 piece Black and Decker set ( 5/32 to 1/2, including 5/16 size) from Lowes. 1. The Panavise comes with a black plastic end cap (see photo), if your's has not come off yet, remove it by over expanding the vise jaws which will pop it right off. 2. Hacksaw the coupling nut into 2 pieces, the shorter one about 1/8 inches long (this will be your jam nut). File the ends smooth and flat with a metal file. 3. Thread the jam nut about 1/4 inch onto the end of the vise screw (see photo). Install the longer coupling nut section and tighten both together using needle nose pliers and a wrench to firmly lock the coupling nut to the vise screw. For extra insurance - use Loctite on the nuts. 4. Put a 5/16 nut driver into your power screwdriver or drill and engage the coupling nut - you will now be able to power the vise jaws open and closed. 5. I recommend doing the final bit of tightening manually rather than under power to avoid damaging your part and/or Panavise. I have this vise and want to expand it to hold wider PCB boards..
Just clamp your board in a larger clamp, then hold the clamp in your vise. Doing that has the added benefit of instantly turning your vise into a speed fixture too. You can use a bigger clamp than I'm using. This design comes in models up to 3 feet long. That should hold whatever circuit board you might want to. Awesome design, and gotta love the price point! Thanks for sharing!